Allow SMS Messaging in Communications allows SMS (TXT) messages to be sent. To utilise this functionality, you must have an account enabled by PCSchool. Email sales@pcschool.net for further details. Enable Caregiver Email in Behaviour is required when emailing from “Behaviour Notes”to see the caregiver tabs. This was implemented for schools wishing to restrict the sending of emails to internal staff or the student only from this control. When sending email from Spider, the “From” address will be the Identity’s email address by default. This can be changed to another address however this will be governed by the settings of the mail server your school is using. If using an open relay (Eg Port 25), not additional authentication will be required. If using a secure mail server, however, additional authentication details are required. This applies to mail servers such as Gmail and Office 365. The email address separator character your email server expects. Should mail requiring authentication use the details set up in the SMTP_AUTH_USER and SMTP_AUTH_PASSWORD keys? If “False”, user must enter their own details each time. The examples below are based on a user Anderson with an work email of admin@pcschool.net using a mail server that requires authentication. From the view above, the users “From” address from Identity has been used however no authentication details are present. The user will need to enter their authentication details in every time they send an email. Although the password does not show, the SMTP_AUTH_PASSWORD will get used when sending this email. 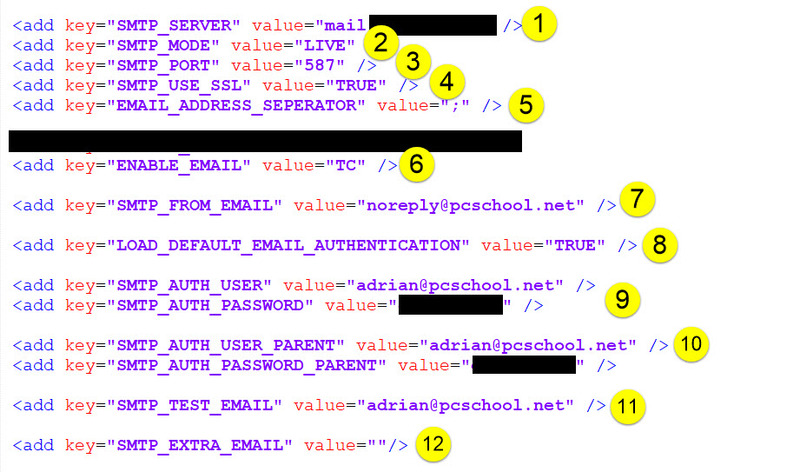 Depending on the behaviour of the email server, the “From” address may get switched for the SMTP_AUTH_USER’s email address, in this case adrian@pcschool.net. As this happens on services like Gmail, the original senders email address is appended to the based of the email sent. If the user wishes the email to arrive from their address, rather than relying on the footer, they will need to replace the default authentication users details and replace them with their own.